There are almost 250 different sessions slated for the annual meeting of the World Economic Forum in Davos, Switzerland. To say that this is going to be a busy week is an understatement. What to attend, who to speak to and about what are taxing the minds of the thousands who are now descending on the mountain retreat. Security, an ongoing and dominant global topic of discussion, will be tight; I don't envy the job of the organisers. Amongst the opening day's eleven sessions, nine of which are devoted to setting various agendas, are a couple of spots aimed at helping us to navigate 'the entire annual meeting in a wireless and effortless manner'. Technology is moving forward at a rapid rate of knots, and to the extent that it is also one of the agenda setting items that will be addressed first thing on the opening day on Wednesday. A diet of three letter acronyms, I hope, is not in store for us immediately after breakfast on the first day. The technology industry agenda session is billed as 'a fascinating focus for an enormous number of technophiles'. There is so much more, however, to discuss about where technology will be going during the course of this year. The industry is not just the sole domain of technophiles. Everything we do today seems to come complete with technology attached. Economic growth, particularly in developing countries, will owe much to advances in technology. On the subject of economics, the recent conflicting data from the US will unquestionably fuel debate about the pace of recovery in leading countries around the world. Contrary to conventional wisdom, America is not creating anywhere near the number of jobs that it should be at this stage of the economic cycle, baffling the legions of high-brow number crunchers in the process. Not I suspect for very much longer. Opinions about how America can continue to re-write the text and record books about its jobless economic recovery will be an abundant commodity at Davos. Economists, well some of them, are just unable to predict an end to the jobless recovery phenomenon in the US. Comparisons, of course, are being made with the early 1990s when the US pulled clear of the recession unaided by 15-months of poor employment growth. More than two years, however, have now elapsed since we had solid numbers from the employment front in the US. The gap between what companies are saying about job creation, on the one hand, and official data, on the other, continues to widen. This void will, no doubt, be filled in Davos by a copious amount of anecdotes and theories. There is one certainty: Only when the full picture comes into focus will the economists come to some kind of, call it loose if you like, agreement about the underlying mechanics of economic recovery in the US. The US will be at the centre of a lot of things this week. There's Iraq, the dollar, and interest rates to name but a few. The continued economic emergence of China and India, risk management, corporate and social responsibility, health, and global warming also will feature strongly and be discussed at macro and micro levels by the voluble army of participants. There will be so much going on; it's impossible to cover the waterfront. The day job! Time has to be found for this and the more informal, but no less important gatherings in the evenings as well. 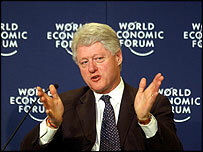 Davos is undoubtedly one of the most significant dates in the calendar. Representation of this amount of cultural, political and economic diversity in the same place at the same time is almost unimaginable. Again, I don't relish the task of the organisers to make this happen. I would wager that logistical planning for 2005 has already started. Happen it will, and the output from Davos will again entail a mind-boggling amount of media coverage that will aim to sort the wheat from the chaff and bring to the attention of the outside world the most important aspects of events that unfold in Davos. How many journalists, I wonder, will take advantage of the advances in wireless technology and file stories direct from their laptops? Having an open mind is one way to navigate successfully through the long days at Davos. This is, perhaps, the most rewarding approach. But that's only my opinion; the air at Davos will be full of opinions, new and old. A tiring week is ahead of us; so too is a valuable chance to learn and understand, move forwards and make progress towards achieving the numerous and necessary goals that are on the world's agenda.